IAI offers complete system solutions, instead of building a robotics system from scratch, design engineers can purchase fully-functional units from IAI and begin production sooner. Their straightforward programming language and pre-formatted products make it easy to integrate IAI products with other components. Buying off-the-shelf Intelligent Actuator products is more cost-effective than building your own, and puts your project into production sooner With the introduction of a full range of ROBO Cylinders, IAI is also leading the transition away from pneumatics to cost-effective, low-maintenance, and fully-programmable electric cylinders. Ushering in a new era of easy electric cylinder control, the easy ELECylinder is designed for simplicity from start-up to maintenance. Speed / Acceleration settings can be set in just 5 minutes. No time-consuming programming is necessary. You can also operate it with ON / OFF signals, like a solenoid valve. No time-consuming programming is necessary. Air cylinders cannot operate at high velocity due to the impact at stroke end which occurs when excess velocity is applied. 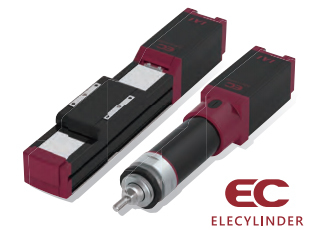 The ELECYLINDER can start and stop smoothly at high velocity, reducing cycle time. Economical and easy to use, the ROBO Cylinder® is specifically designed to accomplish the simple tasks usually assigned to air cylinders, but with greater flexibility and control. Offering custom control over position, speed, acceleration, deceleration, and torque, allowing for mid-move velocity changes, and control from a PLC, the ROBO Cylinder® is a versatile and easy-to-use alternative to pneumatic cylinders. Vision compatible, Ethernet-ready, cleanroom, wall & ceiling mount models available. Fastest in the Industry! Introducing the New SCARA Robot IXA! 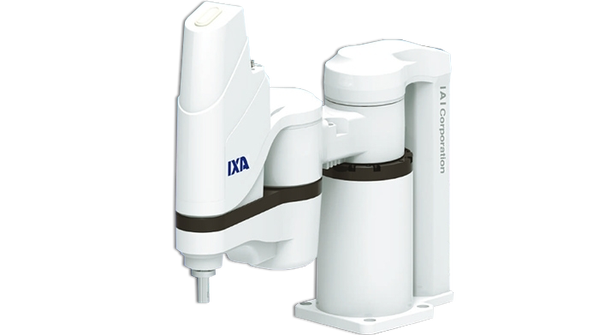 The high-speed IXA SCARA Robot holds the fastest cycle times and yet achieves a lower price than previous SCARA models. The arch motion smoothly blends both horizontal and vertical motion to accomplish continuous high-speed cycle times. Motorized Electric Grippers achieve high grip force and long stroke in a compact body. IAI Grippers come in 2 Finger and 3 finger configurations. The slider type with a guide promises excellent rigidity, while the lever type ensures easy gripping of the load because the levers open 180 degrees. Features include multi-positioning and adjustable grip strength. IAI offers a wide range of linear actuator solutions including clean room and high speed high payload versions. 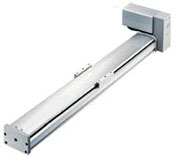 The ballscrew-driven linear actuator is based on an extruded aluminum frame with a built-in linear motion guide system. An AC Servo motor provides closed-loop feedback to the motion controller. Replacing the ball screw with no-friction magnets, the Linear Servo (LS) series magnetic linear actuator delivers exceptional repeatability at ultra-high speeds. And if you are looking to dramatically reduce your cycle time, the LS magnetic linear actuator can accelerate or decelerate at an extremely fast 3G – much faster than even an advanced ball screw linear actuator. The IF is a belt-driven version of the IS Actuator. By combining the high moment loads of the IS with the speed of the FS, the IF Series has proven itself in providing torsional rigidity, reliability, and high speeds. The ICS provides a complete system solution! The ICS usually consists of various combinations of the ISP or ISPD (Clean Room) high-performance actuators which feature exceptional speed, rigidity, repeatability, and payload capabilities. Additional possible combinations include those using Robo Cylinders, IF, and other series actuators. An ICS is a complete system, including the high-performance X-SEL motion controller and all necessary brackets, cables, and cable management. Various communication options available on the X-SEL controller ensure smooth integration.